Mary Austin was the love and inspiration of one of Great Britain’s biggest rock performers. But she never tried to use that for her own personal gain or to take advantage of others. She grew up in a struggling working-class home in West London, where her father worked as a hand-trimmer for a wallpaper specialist and her mother was a maid. Under such circumstances, she had to grow up quickly. She dropped out of school at the age of 15 and became a receptionist, making a modest income. She moved up some shortly afterwords, when she got a job at Biba. This was a very fashionable place, and the customers included some of the biggest celebrities of the time. She enjoyed it all. Then one night, she attended a rock concert at a nearby college. While there, she ran into a friendly acquaintance who worked nearby, Brian May. They hit it off and they began dating. The relationship was fun, but it never got serious and they broke up on friendly terms. May was a musician and was starting a band with some talented friends, and one day he introduced her to the band. Brian wanted to name the band Build Your Own Boat, which Mary supported. However, the majority of the band chose the name Queen. Though she wasn’t aware of it at the time, she attracted the infatuation of the group’s lead singer, a co-worker of May’s who called himself Freddie Mercury. Mercury soon frequented the store she worked at and they became increasingly friendly. Six months later, he surprised her by asking her out on a date, which she accepted after some hesitation. Both were financially strapped, so they had to do things together that didn’t involve spending money. He was a flamboyant person in public, which she found intimidating, being a shy and unassuming person, herself. However, she eventually got to see the side of himself that he didn’t show others, a serious and quiet person who was mistrustful of others. They grew close and moved in together in 1973. Money was tight, but his band began to get some gigs and they were able to move into a larger apartment. One one occasions, he took her to a showcase at Eating College of Art. Mary was highly impressed by the quality of his work. So was everyone else there, and she knew then that he would go on to celebrity. Feeling completely out of her element and ill-equipped for that rarefied world, she decided to end the relationship, but Mercury refused to let her go and pleaded that they were meant for each other. Reluctantly, she agreed to stay, but didn’t think he would stay interested in her. Mercury’s band Queen quickly took off and became one of the most popular bands, and Mercury had a presence on stage that commanded attention. 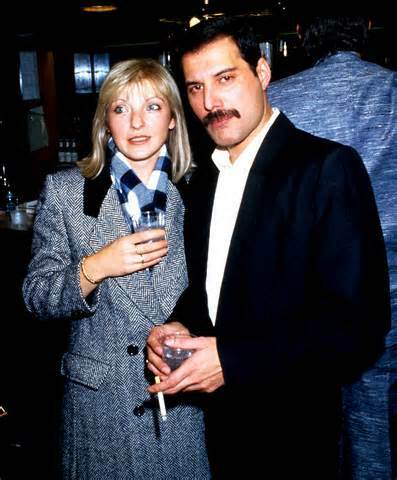 Mercury wrote a few songs about her, most notably “Love Of My Life.” However, he and Mary were beginning to grow apart and she suspected that something was now missing from the relationship. In 1980, he revealed to her that he had been increasingly unfaithful to her and that his partners were of his own gender. Being rather naive, she was astonished by that aspect of it, though she had long suspected that he had been unfaithful. Shorty afterwords, she decided to move out and get her own place. However, although the break-up was hurtful, she wasn’t angry or bitter, and she took an apartment that was near their own place, and they remained close. He hired her to be the secretary to the the band’s publishing business, and she often toured with them, getting to see places and people she never imagined she’d see. She enjoyed it all, but never sought to cash in on it. She also began to have a life of her own outside the band, which Mercury wholeheartedly supported. It all came crashing down for her in 1987, when he revealed to her that he had tested positive for the HIV virus. She was the first person he told, and she never repeated it to anyone through the remainder of his life. One of Mercury’s top priorities was making sure that Mary was financially secure, but she was interested in making sure he take care of his health. Mercury continued to perform off and on, but rumors about his health increased in the tabloid press. Finally in 1991, his health deteriorated and he passed away near the end of that year at the age of 45. In the settling of his estate, Mary was left with the majority of his vast fortune, more than she expected. Including in that was his palatial mansion, which she agreed to move in to. That turned out to be more complicated than expected, as the mansion had a large staff and the settling of Mercury’s estate took several months. After a period of mourning, Mary got on with her life and married. She also started a foundation in Mercury’s memory, and also continues to support Queen’s musical efforts. She continues to live quietly in the mansion, but occasionally grants interviews. Mercury left her in charge of placing his ashes and never for no reason tell anyone where.